Al Benzschawel Plumbing, Inc. has been meeting the plumbing needs of its customers for nearly 50 years. Call or visit our plumbing shop and showroom in DePere at 1759 S. Broadway, to discuss what we can do for you. 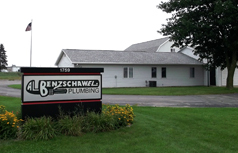 Al Benzschawel Plumbing, Inc. opened its doors in 1968. Since that time, Benzschawel Plumbing has been able to pride itself on customer service, efficiency, cleanliness and most of all honesty. This second generation family run business is one of the oldest plumbing companies in the greater Green Bay area and it is because of the way its customers are handled. No matter the size of your plumbing project, you will always feel well cared for by Al Benzschawel Plumbing. Our licensed technicians are courteous, timely and tidy about their work. We have built an immense repeat customer base due to our reputation, honesty and competitive pricing. We specialize in new construction, remodeling, and the installation of: water heaters (tankless and tradition tanks), sump pumps, garbage disposals, water softeners, sinks, toilets, tubs and showers. If you find yourself with a leaky kitchen faucet, no hot water, or if dropped your ring down the down the drain, Al Benzschawel Plumbing, Inc. has all of your plumbing needs and solutions! Benzschawel Plumbing has a long standing working relationship with some of the most prestigious home builders in Northeast Wisconsin and is also a member of the Brown County Home Builders Association. Benzschawel Plumbing was once again recognized as a Readers’ Choice Award Finalist in The Best of The Bay. We offer all the highest quality brands: Kohler, Delta, Moen, Aker, Oasis, Warm Rain, Glentronics, A.O. Smith, Navian, Little Giant etc. at a price to fit your budget. Click here, or visit our showroom at 1759 S. Broadway in De Pere to see the endless possibilities! We are proud to be a part of the DePere and greater Green Bay community and have been providing excellent service to our customers for nearly 50 years! Please visit our testimonials page to hear what a few of our loyal customers have to say about Benzschawel Plumbing.